Made this Dovetail today from a horrible nodule, every flake I took wouldn't knap because of powdery urchins, turned the whole nodule into debitage till I tried this flake, napped beautifully despite the urchin dead centre. wow that looks great - i think the inclusion in the centre just adds to the item, well napped. I've never really thought about that, I'm not sure what the law would be on knapped knives. I'm sure it would cause the CPS to scratch their heads. One ligit reason to carry one I think is to hijack an airplane as you could walk straight through the detectors carrying one. Interesting point, is a flint knife technically a knife. After all, I don't think there's a law about carrying flint. Blimy! Hope I haven't given some ill intentioned ne'erdowell an idea. Well finally managed it after an 8 months break, got a box of stone mailed to me internationally and went knapping last weekend. 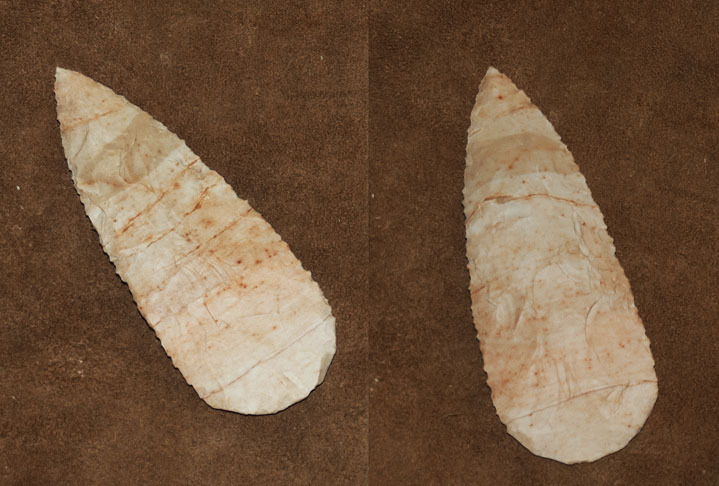 found myself a nice quiet spot by the river, or so I thought, as two old ladies drove a herd of buffalos past me mid knapping Shook off the rust by messing up my first attempt big time and just about managed the pretty poor biface second attempt, nice pretty piece of chert though. Very nice work, I like the banding. wow they look great, looks like a nice bit of material. Hiya, this is my latest! I've run out of decent flint and have had to move on to the last of my large pieces of glass, the edges need some fussing over but i'm quite pleased with this monster. you did well not to break that - can i ask - what thickness was the glass you used and what is it now it is knapped? You can't deny it, glass just looks so good when well knapped. I've started collecting bits of coloured glass to make small arrowheads. It was 19mm (3/4") thick glass to start off with, wombled from a skip of course! Well arrived home, went yee ha can knap properly again and went mad. Here's the last 3 days work. Sadly none of the flint was big enough for the planned Beaker Dagger but never mind. 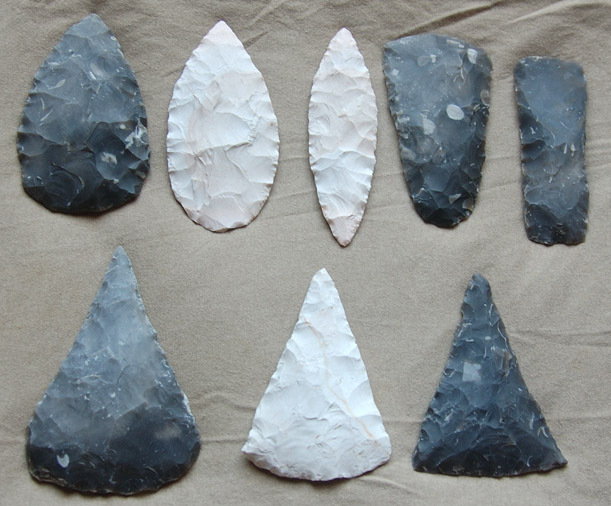 3 leafs blades, an Acheulean Hand Axe, a couple of Tomahawks, and tried a new venture a couple of axe heads top right, one Neolithic and one Tranchet. They're all around 5" in length. Have you ever thought of polishing one of the axeheads. Sounds like a lot of work, but maybe an interesting exercise? Polishing does seem an interesting experiment, according to this vid, not so long as I thought. Very interesting vid, and a fairly efficient tool at the end of it. I bought a couple of antlers, £30 and should get around 15 knife handles from them, looks like I'm back into knife making. 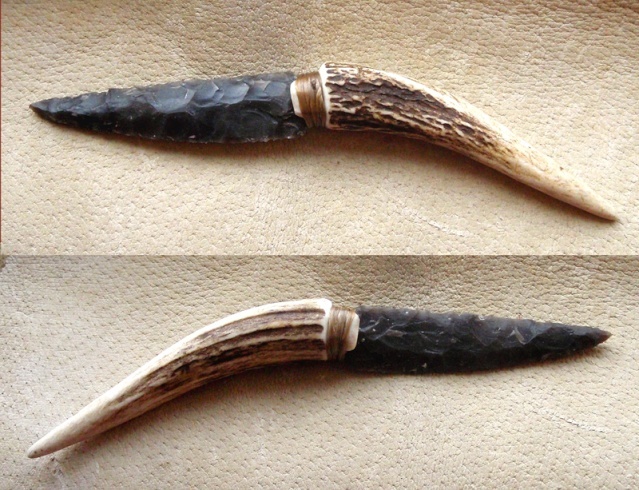 Here's the first, the blade is flint. Veery nice, is the binding sinue? That hafting method looks really good. Yes, sinew, I make a tang on the flint, glue it using pine resin and beeswax, then wrap it in sinew. Only on my hand when making them.... which I why I now keep a good supply of plasters in easy reach. I used to make a couple a week and sell them on ebay. That was about 7 or 8 years ago before they banned knives. Last night I counted I had had 35 blades finished awaiting handles and around 10 finished knives. Wish I could find somewhere to sell again.